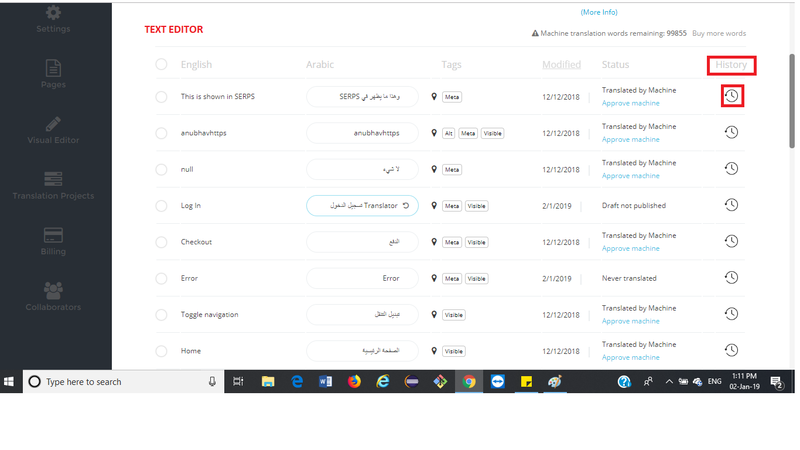 The Translation Revision History feature provides you with a complete history of all the changes a string of content has gone through from time it was first scanned by Bablic scanners. It keeps track of every change made to a string over time. a) TEXT EDITOR: Go to Dashboard->Pages and click on any page to access its content. You can also click on 'View Content from All Pages' to view the content from the entire site without distinction by page. Once inside Text Editor, just click on the clock icon under the "History" column. b) VISUAL EDITOR: While in the Visual Editor, right click on any text string and choose 'Edit Text'. 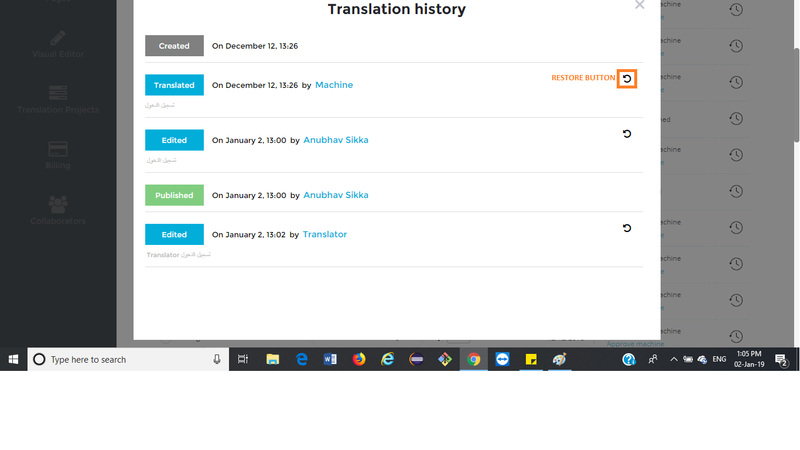 The Translation History icon will appear on top right of the translation box. Every time content is translated, whether by a human or a machine, all changes are recorded in the Translation History together with the actual text, the date and time, and its author. You can restore a past version of a translation by using the 'Restore Translation' button. 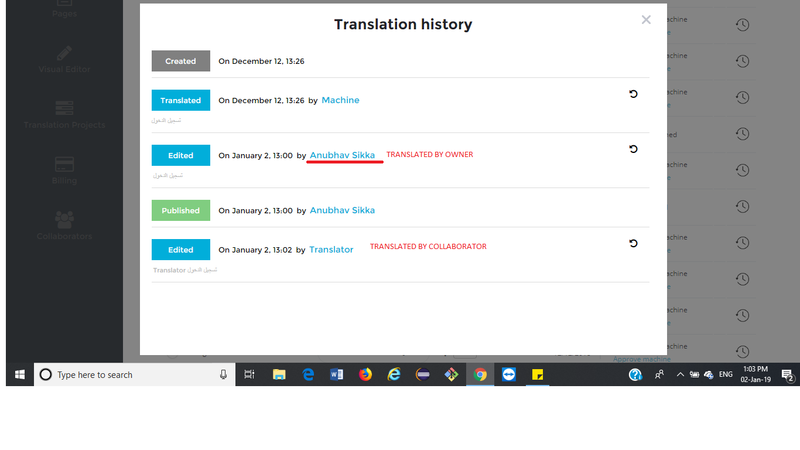 This allows you not only to keep track of your translators' work, but you can also go back to previous versions of translation with a simple click. CREATED: When a string is first scanned by Bablic. TRANSLATED BY MACHINE: When a string is machine translated. 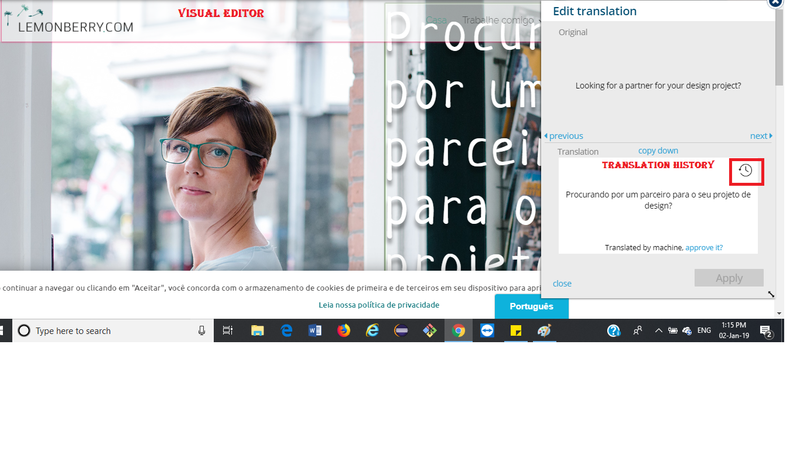 EDITED: If a translation is manually edited, translation status changes to 'Edited' followed by the text of the translation. PUBLISHED: Once a translation is approved and published on live website, its translation status will be changed to 'Published'. EDITED ( Edited by Collaborator): When a string is a translated by Collaborator, it will show the respective translation along with the name of the collaborator who made the change.